Revenue and return on investment now outpace traditional web metrics like page views or email open rates for CMOs, according to a study. 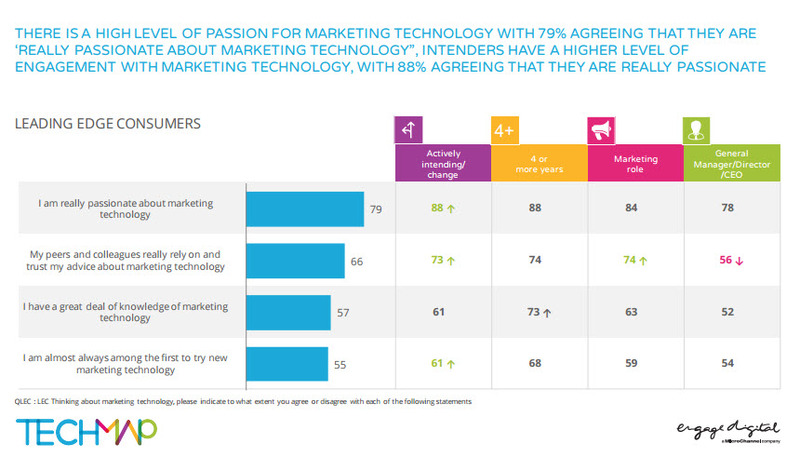 And the leading-edge consumers of marketing technology are pulling ahead of theirs peers on these measures. Such a result may seem self evident, but even as recently as a year ago the evidence of industry studies — and the attitudes of market participants — suggested otherwise. The interactive research report, called “Why Marketing Technology Matters 2016”, was commissioned by Engage Digital and was conducted by GfK. Additional analysis was provided by the Which-50 Digital Intelligence Unit and the results were delivered by Engage Digital managing director Jeff Clark to the ADMA TechMix conference in Sydney on Friday. While that’s a finding which is likely to warm of the hearts of CEOs who have been looking for marketing to step up, other aspects of the research suggest CMOs still haven’t shaken off all of their colouring-in department heritage. Despite this, solving the single view of the customer conundrum — which is table stakes in the integration game — rates last on the list of Mar-Tech use cases, suggesting that too many marketers still regard it as an SEP — Somebody Else’s Problem — specifically IT. Satisfaction with marketing technology is quite low — four in 10 are somewhat satisfied but only 15 per cent very and four per cent extremely satisfied. Users are highly satisfied when they see tangible results like increased traffic, sales conversions, improved efficiencies — case studies are needed to demonstrate ROI. Lower levels of satisfaction relate to a feeling that they could be doing so much more, suggesting that more support is needed to help clients realise the full potential of their investment. Anxious to prove effectiveness, there is a level of impatience to see the return from Marketing Technology investment. Ever since Gartner made its seemingly bold prediction that marketing would outspend IT on technology by 2016 (apparently Gartner believes that actually happened in 2015), the relationship between these two culturally divergent disciplines has been under the spot light. According to the study, the research revealed two interesting and seemingly contradictory insights. “On the one hand, in those organisations where marketing and IT do not work well together, respondents actually report seeing more benefits from marketing IT,” the authors noted.